If you’re anything like me, you think SUVs are purpose-built to define drivers as kid-ferrying lemmings. Why can’t you have the ability to haul kids, but the practicality of style and occasional off-road ability. That’s what the people at Volvo and Mercedes-Benz thought when they created the Volvo V90 Cross Country and the Mercedes-Benz E-Class All Terrain. Built on their respective sibling station wagon bodies, both vehicles offer increased ride height and the type of rugged appeal one would expect from a form of weekend warrior transport. You know, the likes of cladded wheel arches and black plastic highlights. Both are priced from around $100,000 before on-road costs and both are aiming to appeal to the buyer who could afford a luxury SUV, but wants to settle for something a little unconventional. So we saddled up and drove toward the country to see whether either made more sense than the other. On face value, there’s a fairly big price gap between these two vehicles – around 10 per cent. The Volvo V90 Cross Country kicks off from $99,900 (plus on-road costs), while the Mercedes-Benz E220d All Terrain comes in at $109,900 (plus on-road costs). Both high-riding variants are only available in one specification – both four-cylinder diesel, automatic and all-wheel drive. Part of the reason the Volvo slides in at under $100,000 is because it has been stripped of most equipment found standard on the E220d All Terrain. Standard kit in the Volvo includes: 10-speaker stereo, 19-inch alloy wheels, quad-zone climate control, eight airbags, auxiliary and USB inputs, blind-spot detection, rear-view camera, low-speed autonomous emergency braking, hill descent control, radar cruise control with braked speed limiter and Pilot Assist (semi-autonomous drive). The driver and front passenger both score electric seats, while a handy cooled glove box, satellite navigation, LED headlights with active cornering, lane keeping assistant, semi-automated parking, power tailgate, powered and folding wing mirrors, anti-glare rear-vision mirror, roof rails, integrated child booster seats, space saver spare wheel, rear cross-traffic alert, and wireless hotspot complete the list of standard kit. In terms of standard kit, it misses out on things like DAB+ digital radio, heated seats, air suspension, head-up display, high-speed autonomous emergency braking and matrix LED lights. In fact, if you were to tick every single option box available, you could add $48,200 on top of the asking price. And matching the Merc’s specification as closely as possible, the Volvo requires an additional $10,900 of options. Both vehicles are similar in terms of size, with the Volvo coming in at 4939mm long, 1879mm wide and 1543mm tall. Despite not coming with air suspension as standard, the V90 Cross Country has a superior ground clearance, measuring 210mm. In comparison, the Mercedes-Benz comes with: 20-inch alloy wheels, dual-zone climate control, nine airbags, adjustable interior ambient lighting, blind-spot monitoring, active bonnet safety system, high and low speed autonomous emergency braking, a 360-degree camera, air suspension with adjustable dampers, and radar cruise control with braked speed limiter. The Benz also features semi-autonomous driving capability, electric driver and front passenger seats with memory, first aid kit, steering wheel-mounted paddle-shifters, a cooled glovebox, satellite navigation, and LED headlights with matrix function. There are also heated front seats, a wireless hotspot, voice recognition, lane departure assistant, auxiliary inputs with USB, semi-automatic parking, power tailgate, power wing mirrors with folding and heating, privacy glass, roof rails, variable ratio steering, air suspension with active dampers, Apple CarPlay and Android Auto integration, and run flat tyres. Unlike the Volvo, if you were to tick every single option on the Mercedes-Benz, it would come in at an additional $13,620. The Mercedes-Benz is slightly longer at 4947mm, narrower at 1861mm and shorter at 1497mm. Even with air suspension, the best ground clearance the E-Class All Terrain can muster is 156mm (up from a standard ride height of 121mm) – that’s less than cars like the Suzuki Ignis, Mazda CX-5 and Subaru Outback. While the Volvo wins out on initial purchase price, the Mercedes-Benz ends up cheaper when you tick options that really should be standard – such as smart phone integration, head-up display, air suspension, DAB+ digital radio and a 360-degree camera. Given these cars are based on their station wagon siblings, the interiors echo what is already on offer. That’s not a bad thing if you’re after a luxury tourer. If either of these are on your shopping list, you probably enjoy going away for the weekend and perhaps have younger kids that will be comfy in the smaller-than-an-SUV interior. Both vehicles come with a leather interior, which means it’s easy to clean and maintain. The Volvo’s cabin takes a simplified approach. Buttons are limited to an area that surrounds the volume control, along with a small cluster near the gear lever – in comparison to the button explosion in the E-Class All Terrain. Generous storage cavities up front include large central cupholders, but a small-sized centre console and globe box. While the centre console has a lid, the cupholders and small storage tray at the front of the console can be slid closed to hide valuables. Infotainment comes in the form of a 12.3-inch portrait-oriented colour touchscreen. At first glance, it can be tricky to use with buttons requiring an attentive push, which can be difficult while moving. But, over time it becomes easier to use. It can be laggy at times and some items are buried within menus. Apple CarPlay and Android Auto is optional and while it’s a feature that makes sense on cheaper cars, these higher-end vehicles tend to have a superior feature set and navigation system, making smartphone integration somewhat redundant. Luckily the excellent voice recognition system more than makes up for it. It understood every command we threw at it from calling contacts to accepting navigation addresses. Displaying the speedometer and tachometer is a 12.0-inch colour screen that takes up the entire gauge cluster. Some of the screen’s display options can be changed, but it’s nowhere near as customisable as the Mercedes-Benz’s, which offers a number of style and colour changes. While the steering wheel buttons will make sense over time, they can be confusing to use for first time users. They don’t offer any labels and sometimes do things you wouldn’t expect. Like the infotainment, it would be something you would eventually get used to. The seats are extremely comfortable with generous side bolsters and soft padding. They feel great over long distance drives and come with a number of adjustments for drivers of all sizes. Despite the size of the car, the second row offers generous amounts of knee-room, but toe-room is almost non-existent. This makes getting comfortable quite difficult — especially for passengers with longer legs. The two outer second row seats come with integrated booster seats and ISOFIX points, while the centre seat includes an armrest with two cupholders. There’s also four-zone climate control, meaning second row passengers can set their own temperatures. Unfortunately there are no USB ports in the second row and while the second row can be folded, there are no remote release switches in the boot (like there are in the Mercedes-Benz). The cargo area is huge, measuring in at 1526 litres with the second row folded flat (measured to the top of the front seats). Under the cargo floor is a space saver tyre. The cargo area includes a 12V power outlet and a power retracting cargo cover. If you love technology, you’re going to love the two giant 12.3-inch full HD screens that greet you as soon as you open the door of the Mercedes-Benz. They are a technological marvel and operate in a very high-resolution without the pixelation of older displays like this. Unlike the Volvo, the driver display can be configured in a number of ways to show a variety of content. The multi-purpose steering wheel controls feature directional sensors that simulate a joystick, allowing the driver to scroll left, right, up or down to change settings on either side of the screen. The buttons also activate the incredibly accurate voice recognition system called Linguatronic. One press of the button allows the driver to ask the car to do virtually anything from dialling contacts to entering navigation destinations. A longer press of the button activates the voice recognition system on your phone. So, for example, a long press with my phone connected over Bluetooth allows me to write a message to Alborz, asking him why he has bought another expensive supercar. It also comes with Apple CarPlay and Android Auto that allows further smartphone integration. But, like the Volvo, we feel that using that system on a higher end car like the E-Class All Terrain actually removes functionality. Like most Mercedes-Benz products, the Comand infotainment system isn’t the easiest to use. A lot of the functionality just doesn’t make sense and some items are located in strange places – like adjustment for the head-up display. Instead of being within the car’s settings on the main infotainment screen, the setting for adjustment is within a menu on the tachometer display. We’re sure owners of the car will eventually become used to the system, but we continuously find it counter intuitive compared to systems like BMW’s iDrive. Gear selection takes place using a column shift selector, while the steering wheel has steering wheel-mounted paddle-shifters for instant gear selection. The bulky Comand control sits within the centre cluster, which robs space for odds and ends. But, it does make up for it with a large cavity at the front of the centre console for cups, while the split centre console opens outwards to reveal a generously-sized storage compartment. Despite both vehicles offering beautifully presented interiors, the E-Class’s interior feels a bit cheap in places. The piano black finish doesn’t feel or look premium, while the lid for the front centre console bin feels a bit flimsy – it’s just a nitpick in an otherwise nicely presented interior. The LED ambient lighting around the cabin can also be customised from one of 64 colours. Second row leg room in the E-Class All Terrain is superior to the V90 Cross Country with stacks of knee- and toe-room. The rear of the first row seats have cut outs for knees, meaning taller passengers won’t find it a claustrophobic place to be. There are no USB ports in the second row, but there is a 12V power outlet. The centre armrest includes two cupholders, but tri-zone climate control is optional. Cargo space measures in at 670 litres with the second row in place, but expands to 1820 litres with the second row folded. The seats can be dropped remotely thanks to a switch in the boot. A 12V outlet is available for camping appliances, while the use of run flat tyres offers an extra cargo hold beneath the floor. If we had to pick a winner based on interior alone, it would be the E-Class All Terrain. Despite the seats not being as comfortable as those in the Volvo, the features, execution and interior room is better on all fronts. Given the nature of these cars, we decided to include a highway loop, a run through a built-up suburban area and a stint in the country across a variety of low quality and unsealed roads. Under the bonnet of the Volvo is a 2.0-litre turbocharged diesel four-cylinder engine that produces 173kW of power and 480Nm of torque. Attached to our VBox, it managed a 0-100km/h dash of 7.3 seconds, which is 0.2 seconds quicker than Volvo’s claimed time. The engine is mated to an eight-speed automatic gearbox and an on-demand four-wheel drive system. It has an offical combined fuel consumption figure of 5.7L/100km. The Mercedes-Benz uses a 1.9-litre turbocharged diesel four-cylinder engine that produces 143kW of power and 400Nm of torque. We also tested it using our VBox and it managed a 0-100km/h time of 8.5 seconds, which is slower than the claimed 8.0 seconds. It uses a nine-speed automatic gearbox and a permanent four-wheel drive system. 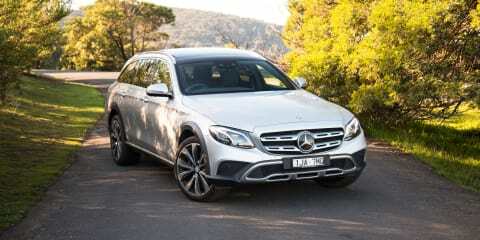 Like the Volvo, Mercedes-Benz claims a combined fuel consumption figure of 5.7L/100km. Our highway run stretched about 40km and included speeds from 80 to 100km/h. Both cars sat nicely at highway speeds, with the Mercedes-Benz showing a bit more cushion and poise over small bumps. The Mercedes-Benz also proved most efficient, consuming just 4.4L/100km on the combined cycle, with the Volvo using more at 5.8L/100km. We used a section of coarse road at highway speeds to measure sound intrusion into the cabin. The Volvo felt significantly louder, both during acceleration and at cruising speeds. That proved true according to the decibel meter, which recorded a peak reading of 87.4dB for the Mercedes-Benz and 89.3dB for the Volvo. For reference, for every 3dB there is a 100 per cent increase in sound intensity or acoustic power. That means that a difference of 1.9dB between these two vehicles is one that’s easily perceptible. At lower speeds, the Mercedes-Benz again proved to be the most comfortable around an urban circuit. The road included a few speed humps and some cobblestones. Where the Volvo would hit bumps with a bit more intensity, the Mercedes-Benz would wash them out thanks to its air suspension. While the coil sprung suspension used in the Volvo isn’t as firm as that featured in the XC90 SUV, it’s still not quite as smooth as the Mercedes-Benz. That’s despite the Mercedes-Benz using 20-inch alloy wheels with 35 profile rubber at the rear and 40 profile tyres at the front. In comparison, the Volvo uses 50 profile tyres all round. While we didn’t get a chance to test it, we expect the optional air suspension on the Volvo would improve ride quality. Over the course of the highway and urban run, we found the Volvo was far more responsive off the line and in gear. It accelerated harder in each gear and the torque felt more accessible. That’s partly thanks to a gearbox that didn’t have to hunt as much. Where the Volvo really began to shine was when we began throwing it into corners – both tight and sweeping. One constant radius corner we often use for comparisons had the Volvo clock a peak speed of 70km/h. When tipped in it held tight and the constant addition of throttle didn’t push the nose wide. The all-wheel drive system successfully shuffled torque, and feedback through the steering remained strong and accurate. The Mercedes-Benz was pushed through the same corner, but only managed a peak speed of 64km/h. Despite having wider rubber than the Volvo (275mm at the rear and 245mm at the front, compared to 235mm all round for the Volvo) the nose pushed wide and the steering lacked the feel of the sportier Volvo. Despite weighing in at 1920kg (26kg more than the 1894kg Volvo), the Mercedes-Benz managed to stop quickest from 100km/h, measuring a best stopping distance of 37.8m over 2.7 seconds. The Volvo required 38.9m and 2.9 seconds to stop from the same speed. Our country road stint was split over two sections — B-grade roads and unsealed roads. On the B-grade roads, the Mercedes-Benz excelled with the fast reacting air suspension and variable damping taking care of imperfections that would unsettle the Volvo. A section of continuous wavy undulations caused the Volvo to reach full suspension extension at highway speeds, meaning it would crash over the following undulation. The Mercedes-Benz on the other hand, handled the continuous undulations quicker, which resulted in a more comfortable ride over the surface. It was a different story on potholed unsealed sections. Continuous potholes at different corners of the car caused the Mercedes-Benz to crash over bumps, almost like the suspension system wasn’t allowing a compression as the wheel met the pothole. It’s in situations like this where a simple suspension system will always win out over a complex electronic system. We had the chance to also evaluate wheel articulation in both cars over an offset gutter. It allowed a level of body flex, which meant we could also test how rigid each chassis was. Both cars had fairly limited wheel articulation and both managed to move out of a rutted hole when one tyre was off the ground, meaning torque allocation within the all-wheel drive system works fine. Where we ran into an issue was with the Volvo. With one tyre off the ground and the chassis partially twisted, we could open the driver’s door, but closing it required extra effort. We could hear the door frame hitting the metal receiver indicating there was a slight amount of flex within the chassis. We didn’t have an issue with the Mercedes-Benz during the same test. After a decent stint of testing over a variety of surfaces, final fuel consumption figures came in at 8.6L/100km for the Volvo and 7.8L/100km for the Mercedes-Benz. One troubling element of the E-Class All Terrain’s drivetrain, which we have noticed previously with GLE Coupe, GLC and E43 AMG, is a skipping effect when turning at low speeds, it’s almost like one of the tyres is turning at a different speed to the others. It’s likely to lead to extra tyre wear, especially if it’s occurring while the car is moving at greater speeds. Both vehicles come with a three-year, unlimited kilometre warranty. But the big difference comes in with servicing. The Volvo requires servicing every 12 months and 15,000km, while the Mercedes-Benz clocks in at 12 months and 25,000km. If you travel an average 15,000km a year, that means three services over a three-year period. With Volvo’s capped-price servicing taken into account, it costs $2195 over three years. Buyers can choose to cover the cost for up to five years up front, which extends the price to $4050 over 75,000km. Using Mercedes-Benz’s capped-price servicing schedule, the E-Class All Terrain costs $2280 over a three-year period. The company doesn’t offer a capped-price plan for a five-year period like Volvo does. The key difference here is that if you travel more than the average 15,000km per year, the Volvo will end up costing you more in the long run. The Mercedes-Benz is cost effective for buyers planning on travelling a greater distance. A cost that most people don’t take into account when purchasing a vehicle is the cost of tyres. In this instance, there’s a big difference between these two cars. Despite both using Pirelli PZero tyres, the performance orientation and staggered width of the E-Class All Terrain means tyres cost significantly more than what they do on the Volvo. 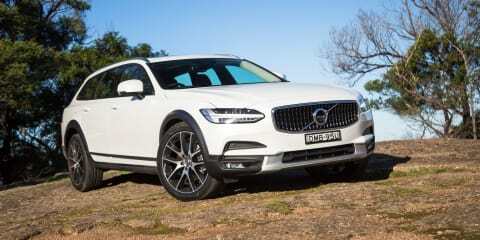 The Volvo measures in at 235/50/19 with tyres costing around $359 per corner, totalling $1436. The Mercedes-Benz on the other hand uses 245/40/20 tyres at the front and 275/35/20 tyres at the rear. They come in at around $531 each for the rear and $505 for the front, totalling $2072. This was a really tough comparison because one vehicle wasn’t head and shoulders above the other. In fact, each vehicle showed it had merits over the other and your perfect choice depends entirely on what you’d like to do with the car. With a ground clearance of just 156mm in its highest setting, the E-Class All Terrain wouldn’t be seen dead in an ‘all terrain’ setting. It also wasn’t as agile or sporty as the Volvo in a ‘winding road’ setting. But, it excelled with interior packaging and presentation, technology, ride quality and efficiency. If you want the better all rounder, it’s the E-Class All Terrain, but if plan on actually using the off-road functions and if you appreciate an occasional sporty blat through the hills, it’s the Volvo that wins. Click on the Photos tab for more images by Tom Fraser.